FULLY BOOKED 2-8 AUGUST. 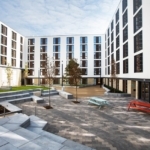 Salisbury Court is a newly built (2017) and highly quality purpose built student development made available for visitors and festival performers during the month of August. 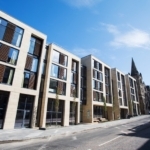 Located in a fantastic festival Southside area, it is near festival locations such as The Pleasance, C Venues and Zoo Venues. Close to facilities of the Royal Commonwealth Pool and with views of Arthur’s seat in the adjacent Holyrood Park. We are offering a number of 'En-suite Rooms' for 1 or 2 person occupancy. 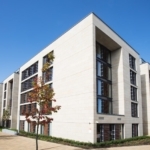 A private lockable room (with key code access) within 6, 8, 9 and 10 bed apartments, each room has a 'smaller' double bed (4ft width), private desk and en-suite shower facilties. There's plenty of storage space with wardrobe, drawers, shelves and under bed space. Bedding and towels are provided and changed on a weekly basis for longer stays. 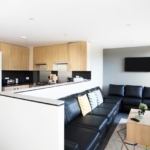 Each ensuite room has access to a communal kitchen (off the bedroom corridor) and these are fully equipped with fridge/freezers, oven and hob, microwave, kettle, toaster, crockery and utensils, flat screen TV (freeview) and breakfast bar /eating area. There is also small seating area and coffee table.